When you think of a typewriter, do you visualise obsolete machines with some decorative value? Do you think of them as the source of the QWERTY keyboard on your computer? Typewriters were the modern technology of their day. Just imagine if you, never having seen a typing machine, were asked to design one. How might it look? The standard design we see today was the result of many years of mechanical evolution. The golden age of discovery was the 1880s and 1890s when ingenuity combined with trial and error led to the manufacture of many typewriters with wildly differing designs. Among them were machines with curved keyboards, double keyboards or no keyboards at all. 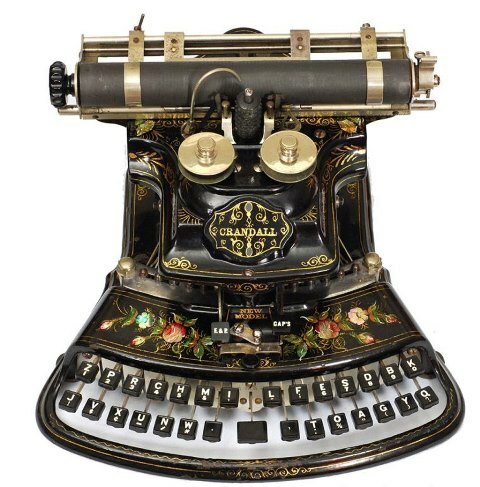 Crandall – New Model, New York – 1887 The Crandall was the first typewriter to print from a single element (no type-bars) well before IBM’s Selectric typewriter of 1961 with its affectionately nicknamed ‘Golf ball’. This typewriter is lavishly decorated with mother-of-pearl and hand painted roses. I have been collecting these wonderful 19th century typewriters for 30 years. I love restoring them, doing research and writing about them. 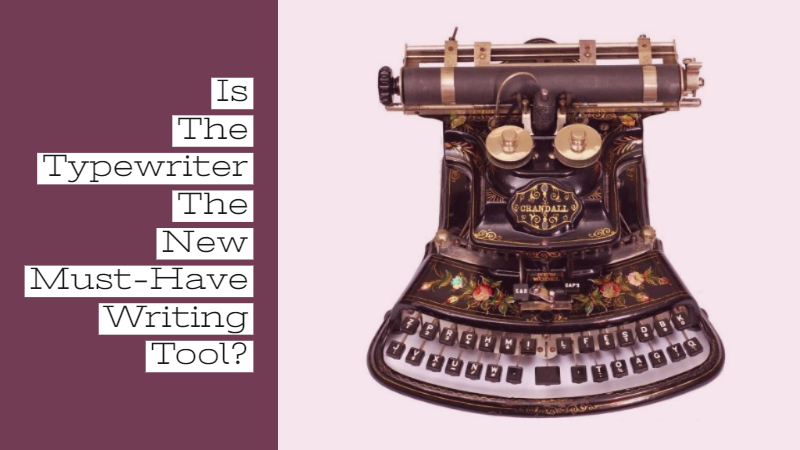 One thing that I certainly did not anticipate, was that the typewriter would have a major comeback in the new millennium. This comeback is part of the ‘analog’ cultural shift that has seen vinyl records become hugely popular again. Why Have Typewriters Become Popular Again? In this age of touch screens and virtual contact through social media, people (particularly writers) can sometimes experience a disconnect between themselves and the outside world. Despite having the world at our fingertips, we sometimes feel isolated in our silent glass houses. One way of making the physical world feel more real is to use tools with moving parts, sounds and maybe even smells, using not digital but mechanical machines that need us to manipulate them. Those under thirty, who were weaned on computers, are especially affected, but the human isolation within our fully connected digital world is felt by all. This is the force that is driving the shift to using old-school tools. Ford, New York – 1895. 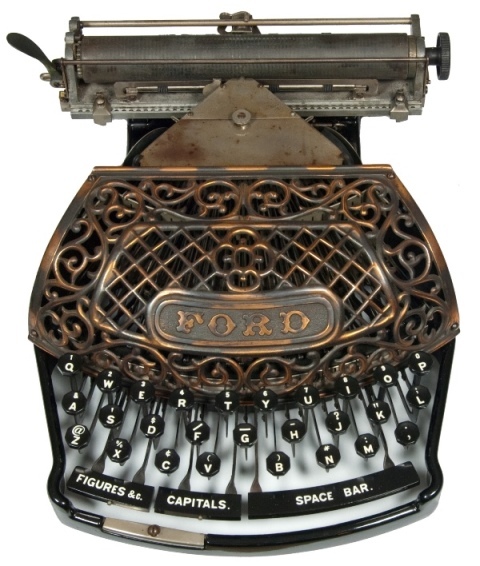 The Ford typewriter is a prime example of late 19th century mechanical aesthetic, with its beautiful grill and gracefully integrated keyboard. It was the first typewriter to use aluminum in its construction, which was a new metal in 1895. Typewriters, particularly 20th century portables, are very much in demand as they provide the tactile typing experience that many prefer because it slows them down, giving rise to a more reflective writing process. There is a sense that the words matter more when typed on a typewriter, as the type bars throw themselves against the paper and the ink impacts the paper with a percussive sound. On a typewriter there is less distraction with typos, as no corrections can be made. The flow of one’s narrative, thoughts and ideas become more fluid. The typewriter becomes the metronome to one’s thoughts. As with all tools, the users experience affects how they feel about the process and indeed, what is produced. So, I encourage those who write to add a new tool to the tool kit and join the growing number of people who are using typewriters every day. To see my collection of 19th century typewriters and some fine 20th century portables which are available for sale, please visit antiquetypewriters.com. You will be amazed at the remarkable range of designs, ingenuity and beauty of the world’s first typewriters. 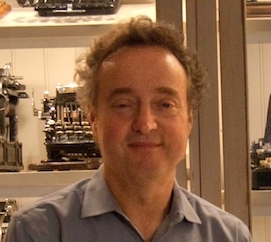 Martin Howard lives in Toronto and has been collecting the world’s first typewriters, from the 1880s & 1890s, for thirty years. His collection has formed exhibits at various museums including the Royal Ontario Museum. Margaret Atwood tweeted this about the collection: “Calling all Gadgetgeeks! Very early days of keyboards: It’s like the Burgess Shale of Typewriters! Incredible!” Follow him on his Facebook page.